over at Bloomacious Cafe today! Check out my blog post on my favorite new items from Anthropologie Home. And while you enjoy your day, I'll be reporting for jury duty :( Ugh!!! Cross your fingers that I don't get on a jury - I don't have time for that in my life right now. 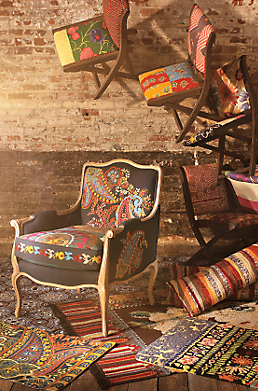 oooh, i so love anything and everything from anthropologie. even their in store and window displays. always fabulously interesting. i'm off to visit bloomacious cafe. jury duty is always taxing to go to, i've never been picked, but would find the way the system works intriquing if i did ever get selected. I love Anthropologie - it's one of my favorite stores/websites. Good luck with jury duty - I hope you don't get picked. Anthopologie is great! Lovely and beautiful items! I hope you don't get picked! You're right, our busy lifestyle doesn't give us time for those things! i love traditional furniture with contemp. fabric. p.s. i didn't get picked to be on a jury! yipee! !